In 2011, while searching for images online related to the Medici, I stumbled across Italy's Secret Places, a somewhat quirky blog that focused on the intriguing and sometimes unsettling aspects of Italy's history, as revealed by its many monuments and inscriptions. 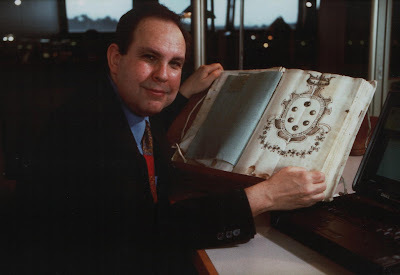 On closer inspection, the author of the blog was none other than Dr. Edward Goldberg, author of books such as After Vasari and the fascinating Jews and Magic in Renaissance Florence. I soon discovered Dr. Goldberg was the founder of the Medici Archive Project (a fact not easily discernible when visiting the MAP website) and is a resident of Florence, whose passion for art and history was expressed through archival discoveries. What followed was a steady and frank exchange of information, as I sought to expand the scope of my writing at 3PP to include a sound methodological foundation. In short time, Dr. Goldberg became a much valued friend and mentor, whom I had the delight of meeting in person (along with Dr. Alexandra Korey) when I returned to Florence in 2012. During both of my brief excursions to Italy, in 2010 and 2012, it quickly became apparent that digital innovation in the cultural sector is something the nation and its dominant institutions are yet to grasp. I often marveled at the impressive feat the creation of the Medici Archive Project represented, and had wanted to ask Dr. Goldberg about this, and many other aspects of his long and interesting career in and out of art history. 3PP In your youth you spent a lot of time at the National Gallery of Art in Washington. What was your impression of the art and history of the Italian Renaissance at this point in time? EG Everyone, I think, is profoundly influenced by the range of art that is available to them—or conversely, not available to them—when they are growing up. As a kid in suburban Washington, DC, my “home museum” was the National Gallery of Art, a place that I still dearly love. Having the NGA near at hand was a huge privilege—a great encyclopedic painting collection in which to find my way. But notwithstanding its amazing richness, it was also a strangely limiting experience. The NGA’s pictures have always tended to be medium-sized and almost too good of their kind—in excellent condition, typical examples of a particular genre or school, pleasing in subject and perfectly installed. Even today, the collection is still rather lacking in rough edges and unsettling surprises. For me, the great corrective was the Walters Gallery in Baltimore—especially as it was back then—everyone’s fantasy of grandfather’s attic, a cozy but quirky enivironment full of odd and strange things that were often challenging and unpretty. Italian Renaissance art was one of the things that I looked at, of course—but not more than anything else. Actually, I inclined most strongly toward Netherlandish art—from Van Eyck through Vermeer (with something of an obsession regarding Vermeer). I didn’t really connect with Italy until I started spending time there—and then my reaction was overwhelming and inclusive. Place and culture and people—not just “Italian art” in isolation. 3PP I have read that you started as an artist. Can you tell us about your work or any of your influences? EG That was a very long time ago! And I suppose that art history is where a lot of hopeless artists go when they die. I always had keen critical faculties, so even as an undergraduate, I caught on that my skills as an art maker were never going to satisfy me nor take me any place interesting. So, the world lost out on a lot of limply atmospheric views of ancient ruins and castles on hills… I shudder to think! 3PP Do you still create art? 3PP How and why did you transition from being an artist to an art historian? Was it difficult to shift from a visual mode of expression to one that is primarily based on text? EG For me, the shift was instinctive and effortless. In the realm of art, it was the sense of traveling through time and culture that I found most compelling. And I am the sort of guy who always wants to know the “inside story”—what went on behind the scenes, who did what to whom in historical situations. And there is no more intensely behind-the-scenes experience than research in an historical archive. 3PP You have spent a lot of time around art historians, and Florentines. Both groups strikes me as passionate, yet obstinate towards change. Is this an accurate assessment? EG Passionate? You must hang out with different art historians than I do! There seems to be damned little passion going around these days—in the sense of personal enthusiasm and driving curiosity. Unless by passionate you mean defensive and reactive. There are, of course, crazed bouts of vulgar self-promotion—with people clambering on board usually silly nondiscoveries. (Think Leonardo!) At least some of that is compensation for the prevailing lack of day-to-day excitement. You ask about “change”… Change from what?! Art historians have never had a clear sense of identity nor a distinct professional profile, which has always engendered a lot of insecurity and protectionism. And this has probably gotten worse in recent years—since it is now almost impossible to make a satisfying career in academic art history. The jobs are simply not there. So, you have a lot of frustrated people fighting over pieces of a rapidly shrinking pie. In regard to the whole “Florence thing”, I am just as conflicted about the place as a real Florentine! It is a very small town and daily life—cultural and otherwise—lurches from one tempest in the teapot to the next. And beneath the veneer of dry Tuscan common sense, they—we—are a race of arm-waving, scenery-chewing drama queens. In regard to “obstinacy towards change”, Florence is an extreme case of the contemporary Italian situation. We are looking at a startling number of smart, gifted and capable people who could be doing great stuff—but they are neutralized by a system that punishes merit and innovation. The real testimony to the Italian (and Florentine) genius is that good things sometimes manage to get done, in spite of the self-created obstacles. 3PP Your role in the creation of the Medici Archive Project was a feat of diplomatic and strategic skill - can you tell us about some of the challenges involved in converting a project idea into a viable, functioning entity - especially in the Italian context? The next step, of course, was “Hey, why not me? !” And that is basically what happened... Fortunately, I had little idea at the outset of how much was involved. I had to work my way through the Italian governmental bureaucracy. I had to create functioning administrative organizations in both the United States and Italy. I had to pull together friends and fellow travelers to form a non-profit foundation with a Board of Trustees. I had to assemble ongoing funding on the both the public and the private sides. Then there was the scholarly and research components. And the necessity of building technological infrastructure—in a context that was shifting at the speed of light. Fortunately, I was working with a team of friends and we shared the same vision and enthusiasm—especially Lilly Morgese in Florence and Joanne Riley in Boston. We are still very close, years after we all left the Medici Archive Project. In fact, when I think of my most valued colleagues in scholarly circles around the world, I see that I got to know many of them as research fellows at MAP. In regard to diplomacy and strategy, I had the best possible training—having lived most of my adult life behind the scenes at an Italian Renaissance court, with all of its intrigue and subterfuge. So the machinations of an American non-profit organization held no surprises, nor did modern Italian bureaucracy. 3PP In scholarly work, such as for Renaissance art history, publication is central to an art historian's reputation and career opportunities. Does this need to change or broaden? EG In regard to scholarly publication, we now have the worst of all possible worlds. You are damned if you do, and damned if you don’t. More and more expense and editorial responsibility are falling on the shoulders of the poor deluded scholar. And however good one’s publications might be, they are less and less likely to function as the essential down-payment on a career. “Change” needs to come from a practical understanding of what we are meant to be doing and for whom—rather than publishing for the sake of publishing. 3PP What is involved in being an "archival sleuth" and what proportion of archival discoveries are as actually as serendipitous as popular reports suggest they are? EG Contrary to popular belief, almost no archival discoveries are serendipitous. You have to know what you are looking for—or at least, you have to know how to read between the lines and pick up the often faint signals. Then one thing leads to another… Most dazzling discoveries only occur after months and years in archives and libraries—learning how the pieces fit together and what really matters in an historical situation. The current epidemic of Dan Brown-style discoveryitis is exactly what it seems and has little to do with real archival research. 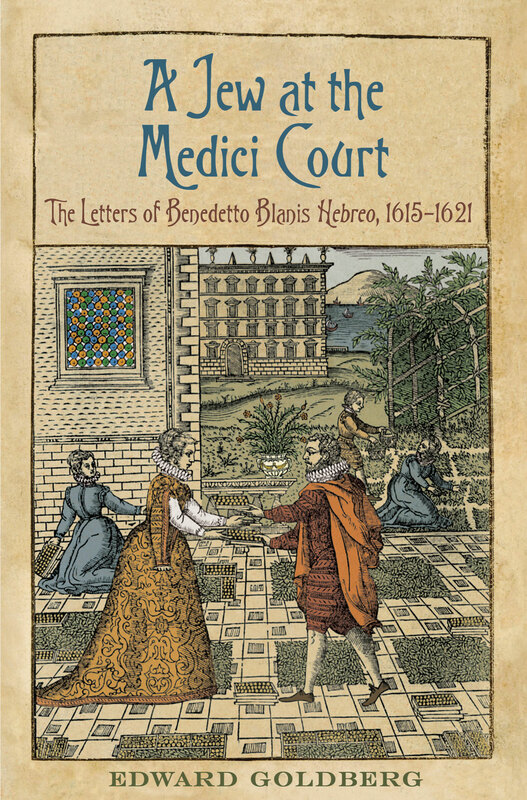 In 2011, the University of Toronto Press published "Jews and Magic in Medici Florence" - an enlightening account of Florentine and Italian society in the 17th Century as revealed by the correspondence between Jewish scholar, magician, procurer of books Benedetto Blanis "Hebreo" and Don Giovanni dei Medici. This was followed in the same year by "A Jew at the Medici Court" - a critical edition of the Blanis letters. 3PP Your work on the letters of Benedetto Blanis was a notable development in the field of Jewish studies in an Early Modern context. What were the challenges in creating a narrative around these letters within the boundaries of your knowledge as an art historian? EG My discovery of two hundred letters from a Jew in the Florentine Ghetto in the early seventeenth century is a classic example of archival non-serendipity. The Blanis letters had been sitting there in the Archivio di Stato di Firenze since time out of mind and people had been racing by—without stopping to ask themselves what was going on and why. Notwithstanding the repeated signature “Benedetto Blanis hebreo”—Benedetto Blanis the Jew—and the astonishingly open discussions of political intrigue, the Inquisition, astrology, alchemy and Kabbalah. I spent seven years giving this “discovery” real meaning—figuring out how the pieces fit together, what the references and allusions really meant. And how Benedetto Blanis himself fit into the picture. I am not a specialist in Jewish history or Jewish studies—which in some ways served me well. The Blanis story is about a Jew who lived in two overlapping worlds—the Jewish and the Christian—and the surviving documentation is almost entirely in the archives of the dominant culture, in Italian and occasionally Latin, not Hebrew. And this is an environment where I know what matters. Creating a solid and consistent narrative in Jews and Magic was the most difficult thing that I have ever done—the practical equivalent of starting up ten Medici Archive Projects! What carried me through was my personal fascination—okay, let’s say “obsession”— with the figure of Benedetto Blanis. He was a sporadically brilliant individual, but also a crazed and ultimately self-destructive one, trying to make a life for himself against daunting odds. In practical terms, my decision to publish a separate critical edition of the Blanis letters really opened things up for me in creating a readable narrative. I didn’t need documentary appendices or massive footnotes because most of the essential supporting material was available in a parallel volume. 3PP Renaissance art and history seems to have a very small clique of innovative and influential bloggers. What is your opinion of this type of work, and do you have any concerns about this type of blogging presently not being geared around a sustainable business model? How can this be changed? EG Blogging is clearly important—indeed crucial—to the future of art and history and art history and much much more. Bloggers are forcing a lot of issues, especially regarding the identification and definition of audiences. Most of what is out there in the blogosphere is mindless squee. But so what?! It is going to take time for the various kinds of blogging activities to sort themselves out and find their own levels. And mainstream institutions (museums, universities, professional associations) can play a major role in creating points around which the new media can coalesce. In regard to technology and communication, the fraught issue of business models is key—as Mellon has long realized. The public has an entrenched assumption that everything online should be free, but that is simply impossible—if quality products are to emerge and be maintained. 3PP At Florens 2012 you observed the innovative work done by the team of bloggers assembled by Alexandra Korey. Although a more prominent part of discussions related to politics, technology and tourism, the concept of blogging does not seem to have been embraced by cultural institutions in Italy at this stage. Is this likely to change? EG Florens 2012 was a very Florentine—and Italian—sort of experience. Alexandra Korey made a heroic effort—against the odds—to pull a top-heavy and characteristically self-generating event into the 21st century and into the international context. And to an astonishing degree she succeeded—in convening a panel of bloggers, introducing dynamic online interaction, etc. The sponsoring organization never quite understood what was afoot, but seemed happy to have a few whizzy bits to show off—which is at least a start. We will see what happens in the future—and soon! Florens 2014 is just around the corner. In Rome with Dr. Goldberg. November 2012. For an explanation of the images and decorations in this post, please see the lecture video in links above. Great interview, Hasan and Ed! Thank you to Dr Goldberg and Hasan for this very engaging interview spanning many topics. I agree re- blogging and understanding target audiences. In what other medium can writers track the whims (and volume) of their audience in real time? I revisited the Medici Archive Project via the link provided. It is nice to see the site has come along since I last saw it - though I see what Hasan means by "not easily discernible" when looking at the "about page"...I am guessing this is one of those "Made in Italy" stories - which I know about all too well - so won't ask. 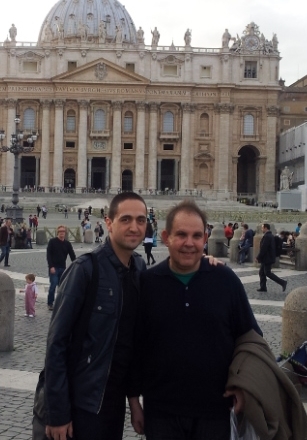 How wonderful to see that photo in Rome. What an interesting time that must have been! So inspiring. You have done it again Hasan, Bravo! I am grateful to you for bringing us closer to the mind of a prominent art historian. Dr. Goldberg's generosity of spirit, deep knowledge and passion for art comes through brilliantly. Ed, "My Life is My Art'- I Love It! I use the same phrase when I remember I started my journey with dreams of becoming an artist. Thank you for sharing your views so openly and honestly, it is enlightening even after having met you. This interview was fantastic! And I definitely added "Jews and Magic in Medici Florence" to my Amazon wishlist. You're seriously bad for my wallet. You know that right? How fortuitous to have fallen into your wonderful site - Soooooo much to read!! Thank you! !